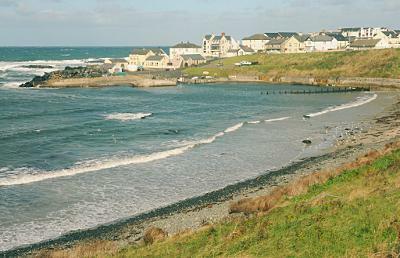 Portballintrae is the closest village to the Giant's Causeway. It is a small village situated to the west of where the Bush River enters the sea. Like most of the villages along the North Coast, the population dramatically increases during the summer months. There are two shops, a hotel and a pub which both serve food and there are also several B&Bs in the area. Adjacent to the Causeway Coast Way are the Lisanduff Earthworks. They are located on a slight rise above the trail shortly after the crossing of the Bush River. They are two sizeable pairs of concentric circular banks which can best be appreciated from the air. Locally known as the 'Cups and Saucers', there is much debate as to the purpose of the earthworks. It is speculated that they date back to the Iron Age and the wet and dry areas symbolised some form of opposites, such as birth and death.